Do you have your own guide and porters, or will you be putting our group with another company or group? Are your guides knowledgeable in the flora and fauna of Kilimanjaro? Are your guides knowledgeable in health and safety procedures? Are your porters well dressed with appropriate clothing and shoes for the trek to the summit? Do Team Kilimanjaro treat their porters well? How many guides and porters will you be assigning to a group of 4 climbers? I have personally selected all of our chief guides, most of my assistant guides, some of my cooks and a small percentage of my porters. On the last selection course I ran, I started at 0545 in the morning with 220 porters and after beasting ourselves up and down our local training hill (Kivesi), having strength tests on the summit and a race back to TKBase there were only actually around 25 names that were permanently added to my staff list. It is very hard finding the best porters who are strong and reliable and hard working and honest and even of these 25 from one particular selection I gather only around a dozen are now working with us because strength and aptitude are just a small part of a porter’s requirements. Because of this difficulty, while I always select every single chief guide for TK, I generally allow the chief guides to select their own porters. But if I have understood your question correctly, we certainly don’t just subcontract somebody else to do our work for us (although legally, there's required to be a separate Tanzanian-registered business entity for this [Kilimanjaro Team Limited], which Team Kilimanjaro - a trading name of Exposure Limited - does legally "contract", although this entity operates exclusively for Team Kilimanjaro). If that sounds confusing, please read our legal page for further explanation. And actually, if we did simply contract a local company, all the above would be potentially fictitious as I would be relying on the word of some local admin staff to answer all these questions on my behalf and I’m afraid the culture of local outfits is not such that the management climbs with its staff, trains or even selects its staff. The management generally wear nice suits and sit in air-conditioned offices and only the mountain crew get dirty and tired. So most local managers would simply not know the answers to these questions, but their agent would have prepared a nice little factoidal brief because they know that so many people ask such questions. Yes, all our guides have at least an acceptable level of knowledge in this field and a couple of our guides have an extraordinary and almost encyclopaedic knowledge of flora and fauna. Frankly, if I’ve got a sick climber and a doctor together on Kilimanjaro and I reach them on the phone, I always get a great deal more sense out of the guide than the doctor. So in answer, it depends who is asking the question. None of my guides have medical degrees but I trust them totally to make sensible decisions and to be decisive in implementing evacuation procedures where they judge this to be necessary. And I trust them a great deal more than I would a doctor, in a high-altitude environment. I have often found doctors speaking outside their field of experience when on Kilimanjaro. This is probably because the medical world’s knowledge of high-altitude physiology is still very poor. Our athletes have done many things that ought not to be humanly possible, if conventional high-altitude physiology is to be trusted. Our porters do not generally go to the summit except by special request, or where a porter has aspirations to train towards being an assistant guide. My guides and assistant guides – who obviously are required to summit – are thoroughly experienced and trusted to choose their own clothes. I would say the greatest concern is that when it rains and snows there is a risk of frost-bite to the toes of guides and assistant guides. This happened once this last year during a climb in very bad weather where it had rained almost unceasingly for 6 days and Nicodemus Axwesso suffered frost-bite along the tips of some of his toes. But he was precisely attired as when he works for another company about 6 times a year whose agent states “Hike with the most experienced, safety-oriented mountain guides on Kilimanjaro” and who charge $7,845 for a place on a climb. Clothing is a matter of perspective. What I would say is that when I personally am already acclimatised and 25kg at altitude I do not dress very dissimilarly from them. However, if a climber is not acclimatised, is moving very slowly (as is recommended and as we will pace you) and is only carrying 5-7kg in their daysack, then a totally different sartorial standard is required. It is a mistake however to judge the needs of porters with respect to the needs of climbers. There are several well-intentioned people – and very few if any of them have ever carried weight at altitude moving at a porter’s pace –who make this mistake and so are horrified that porters wear running shoes in the mountain, for example. While I would never recommend a climber to wear running shoes I have no objection to my men doing this if they are more comfortable in running shoes, as they know the risks and we treat them as adults. Indeed I sometimes do this myself. In the picture at right I am wearing lightweight running shoes and a thin pair of running socks and running trousers on the summit because I am moving at my own pace and I am acclimatised and it is the dry season. But again, please ensure that you do differentiate very clearly between your own requirements (given here) and those of my staff. It really is essential that you have the items on the kit list and if you are at all unsure about the quality of any of your own gear, I would strongly recommend that you hire from us. We notice that consistently climbers will fail to anticipate how cold their hands will get during the assault and snow-boarding or skiing gloves are simply not adequate for unacclimatised people on their summit bid, particularly if they choose to use walking poles. I have been working with my Everest expedition supplier in Kathmandu to develop a range of gear specifically for my Kilimanjaro climbs and we believe that we have the warmest gloves in the world. They have a lightweight Goretex overglove and a very thick down-filled main mitten. Our summit jackets are either heavy down-fill with integral hood or synthetic dual core jackets with integral hood. Both are engineered for 7,000m. We suspect that some readers’ perception of people in Africa may have been influenced by cynical mainstream western media, which in our experience portrays the majority of Africans as poor little exploited people who don’t have a voice of their own. Some bad eggs inevitably capitalise on this perception to exploit naive visitors to Africa, employing the hang-dog look and sausage lips to elicit sympathy in the hoped-for shape of extra cash or equipment that they can instantly sell on their return to Arusha to boost their incomes, but our experience of good workers is entirely different to this picture. The fact of the matter is that the locals have a rich evolving culture, proud traditions, and an open labour market where the best workers can compete for employment in any of 350 different companies in Arusha and Moshi. Team Kilimanjaro staff are generally regarded by most of the rest of the local population as being relatively privileged, with incomes many time is excess of the country’s GDP per capita, and active and varied lifestyles. Our workers have loud and clear voices and full access to all levels of the chain of command, through which any sincere concerns can be addressed. Such concerns are always taken seriously, as our management are cautious to ensure that nothing challenges the corporate sense of purpose and close cohesion that we enjoy and from which emerge the highest standards of cooperation and performance. 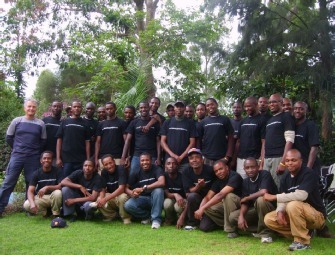 As a pertinent example of the genuine social concerns that motivate them, some of our staff have formed bands through which – far from whining about their own salaries – they use this platform to draw attention to the plights and difficulties of people who are genuinely suffering, the homeless people on Arusha’s streets who don’t have work and struggle even to subsist. 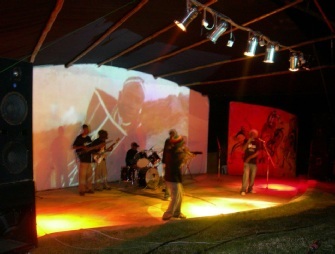 One such example is Watengwa, Arusha’s answer to Harlem’s Immortal Technique. Samples of Watengwa’s work can be heard at right. Those who have a genuine social concern for the people are Africa are most welcome to approach us and we will offer candid advice on how best any funds that people want to donate can be administered. Our recommendations are likely to centre on ways to help the homeless and the sick, though, rather than exploiting climbers’ generosity to ourselves parade as philanthropists whose real agenda is actually to promote their own company’s philanthropic profile for marketing purposes. On a weekly basis, Team Kilimanjaro receives requests from guides asking to migrate their established employment with other operators, to us. We do not believe that such a trend would emerge if it were perceived that our workers were not treated well; particularly when one considers that there are several hundred other climb operations that they could approach. Why should you book with Team Kilimanjaro?